So What Are The Benefits of Being a VRA Member? The main benefit of joining the VRA is our people. We have numerous Local Chapters coming together with others that enjoy the same interests as you do! Perhaps one of the biggest benefits to joining a motorcycle association is the fact that you’ll be able to meet people that you can enjoy group rides with. Chances are most of the riders that already belong to the group will have a lot of riding experience that they will be able to share with you. You’ll probably be able to gain some great riding tips from those who have been around the motorcycle world for a long time. The VRA is a family fun group and is always looking forward to bring new individuals to join in the fun. Dairyland Insurance: 10% off and $10 to VRA per quote. 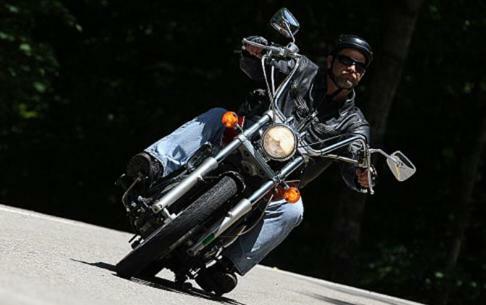 Select "Vulcan Riders Association" from the list of organization when completing your free quote. Note: The VRA earns $10 for each quote. Nationwide Insurance: offers a 10% discount to VRA members. They will require at minimum a membership number and in some cases a membership certificate. Numbers and certificates can be provided upon request by contacting either the National President or Vice President. McKenney-Salinas Power Sports : 10% off discount, ask for Amanda, tell her you are a VRA member and she will hook you up. Reckless Motorcycles : 10% off Fairings. certificate to Reckless hollie@recklessmotorcycles.com and put "Vulcan Riders Certificate" in the Subject line. To receive this discount the order must be phoned into Reckless Motorcycles: 865-856-7313. Discount cannot be given on online orders, or given after the fact. Sebastians Silversmiths, 10% off custom motorcycle keys and any other merchandise on their site, use code VRA001 at check out! Shark Quality Cycle Audio, 10% off audio systems, motorcycle speakers, intercoms, headsets and more. Membership discount code is "VRAUSA"
Chapter benefits are also and by large the most treasured - good friends, good rides, good times… and of course, other non-monetary benefits. Local area discounts are also provided to local chapters by local retailers. There are social events organized throughout the year, these include, Treasurer Hunts, Bowling Nights, BBQs, dinners and other various gatherings to which family and friends are invited. Local chapter merchandise is also available from the chapter. And of course there are also the regular organized chapter rides and rides supporting many charities. The National Officers continue to look into other "discounts" for VRA members...as VRA member numbers increase, so will the likelihood of more benefits...a continued work in progress. I started a benefits page on the website. Last edited by Slicks; 05-01-2012, 10:10 PM. something about the sentence doesn't flow (first para): "We have a friendly and helpful online community who share the same interests who are looking for local members to ride with"........perhaps this: ...share the same interests who and are looking for local...."
- participatig vendors..= missing an "n"
that discount leather shop has really good prices. wow!!! Matt just got all VRA members a 10% discount at Shark Audio! 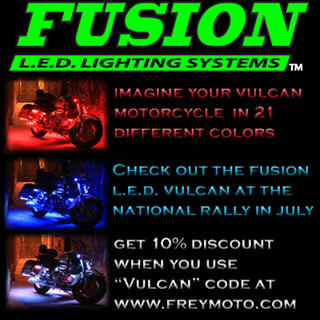 Freymoto is offering light kits for door prizes and they're offering 10% discounts for VRA members at their website. Thanks Patrick (Voyager_PWS)! New Vulcan rider. Getting back on the road after many years in 4 wheel vehicles. Bought a 2012 900 Classic Special Edition last month. Love the bike so far! Where do you get a membership certificate. Dairyland just told me they were going to jack my rate up in 15 days if I dont send them a copy; after I just paid for a years coverage. There is a good chance that would put them higher than other quotes. What a deal. Hey Mike, that representative was just uninformed. I arranged the discount with Sarah Weaver from Dairyland Insurance on August 12, 2010. No membership card or membership certificate is required to receive the discount. Contact me at Secretary@vulcanriders.us if they still insist that a membership card is required and I will straighten it out. Thanks VRA, I just got your e-mail about my post. I did not have a representative, I did it all online. I will send a copy of the e-mail. Again thanks VRA and Slicks. Unless I didn't punch in the correct numbers when I was on their site, they quoted me 3x higher than what I pay through AAA. You might want to give them a call. Thanks for the AAA idea. They have sort of faded from my mind the last few years or more likely my mind has just faded.